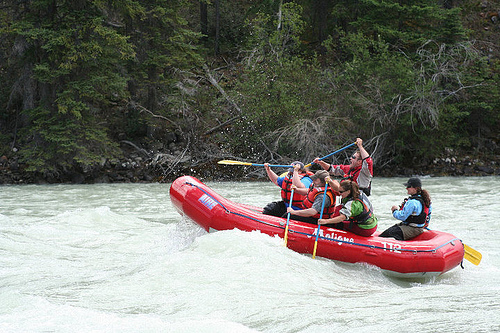 There’s a never ending list of things to do with your time in Lake Louise, Banff National Park and the Canadian Rockies, and lots of ways to organize them to help you plan your Lake Louise vacation. 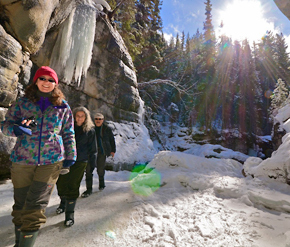 Here’ a quick winter-spring seasonal activity guide to the Lake Louise area, by month. 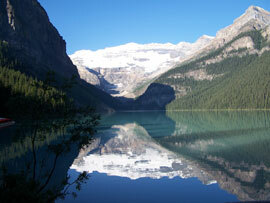 Lake Louise is a top Canadian Rockies vacation spot. So most of us think of March as springtime, and sometimes it is in the Canadian Rockies, but most of the time it’s still pretty wintry. Tobogganing is a great way to get outside and enjoy the Canadian”spring .” The best hill is located right next to the Chateau Lake Louise. You can rent toboggans from Monod Sports (located inside the Chateau). A great place to do some sight seeing is the famous fossil bed Burgess Shale, located just a few minutes from Yoho National Park. The actual quarry is closed during the winter months, but you can still see the creatures that lived there with the help of a telescope. Burgess Shale is famed for being one of only two places in the world where soft-bodied creatures have been found. Send postcards to loved ones and friends or take time to reflect in a journal. The old-fashioned writing desks in the Lake Louise Chateau have seen plenty of visitors over the years, so become a part of the the tradition while sipping a warm beverage. April in the Canadian Rockies may still be a bit wintry, but there’s a good chance you’ll find some mild weather. One fun way to enjoy it would be flying a kit in the beautiful outdoors here. The snow usually has melted a little in the town of Field, 20 minutes away from Lake Louise. The gravel river flats next to the Kicking Horse Pass are a great place to launch a kite if the weather is nice. 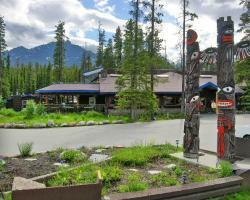 Take a historic journey at the Lake Louise Visitor Centre. 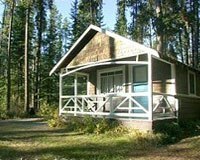 After reading up on history in “Lake Louise, A Mountain Legend,” head over to the Lake Louise Train Station Restaurant for an afternoon snack. Enjoy some quiet reading time in the historic and recently restored heritage railway station. Become a train buff and learn all about the adventures of the railroad from the “Kicking Horse Chronicles” at the Lake Louise Visitor Centre. Then cruise the Trans-Canada Highway to see where it all happened. Bring the pamphlet along as a guidebook to see where all the harrowing stories took place. Lake Louise’s most famous tourism areas begin to open during the month of May, as the weather finally, though not decidedly, starts to warm up a little. Animal sightings are popular on the Icefields Parkway during May because the snow is still in full force at higher elevations. Wildlife congregates near the road in search of food. Drive carefully to avoid any accidents and stay in your cars if you happen to see a bear. It is easy to observe birds in their natural state on Herbert Lake (about ten minutes north of Lake Louise.) Watching unusual ducks is a great introduction to bird watching and Herbert Lake is a great place to see these creatures during their migration northward. There is a picnic area and a trail around the lake. For other bird watching hot spots, check out Kingfisher Lake or McNair Pond. Emerald Lake is a great place to check out early season wildflowers because of its low elevation and early spring. If you are lucky, you can catch a carpet of yellow avalanche lilies that pop up as the snow melts. Sketch any plants you can’t find in your guide book and stop by the Field Visitor Centre to identify them.